Market likes decision to appoint Bush adviser as Greenspan's successor. But he will face challenges. What do you think of Ben Bernanke's nomination to succeed Alan Greenspan as Federal Reserve chairman? NEW YORK (CNN/Money) - President Bush on Monday nominated Ben Bernanke to succeed Federal Reserve Chairman Alan Greenspan, whose term is set to expire at the end of January. Bernanke, currently chairman of the president's Council of Economic Advisers and a former Fed governor, was widely considered one of the leading candidates for the job. In Washington, Bush praised Bernanke for speeches that included "keen insight and clear, simple language," a possible hint that he expects Bernanke to be slightly less confusing than Greenspan, who was often criticized for talking in nebulous language laden with economic jargon. Wall Street seemed to like the move. Stocks rallied as news leaked about Bernanke's nomination. But Bernanke will have big shoes to fill following Greenspan, who earned the nickname of the Maestro for his steering of the economy during his more than 18-year tenure as Fed chair. Still, Barry Ritholtz, chief market strategist with Maxim Group, a New York-based money management firm, said investors appear to be pleased with the decision since Bernanke is a well-known and respected economist. He added that he sees no reason why Bernanke would not be approved by the Senate. "This is much more John Roberts than Harriet Miers," Ritholtz said, referring to the relatively smooth confirmation process for Supreme Court Chief Justice Roberts and the controversy surrounding Miers, Bush's choice to replace retiring Justice Sandra Day O'Connor. "He is a known entity that is well-respected on the academic side, in Washington and by the stock market." To that end, Richard Shelby, a Republican Senator from Alabama and chairman of the Senate Banking Committee, lauded the selection. "Dr. Bernanke is an eminently qualified and superb choice for the nomination of Federal Reserve Chairman. He is extremely well-versed in monetary policy issues and has earned tremendous respect and confidence from policymakers in this country and around the world," he said in a statement. Democratic Sen. Charles Schumer of New York, a member of the Senate Banking Committee, also praised Bernanke. "We need a careful, non-ideological person who understands that the Federal Reserve's main job is to fight inflation and Ben Bernanke seems to fit that bill," Schumer said in a statement. But he added that it will be important to find out at the confirmation hearing if Bernanke would "adopt the Greenspan model of flexibility in monetary policy that has served our economy so well." Like Greenspan, Bernanke is known for his tough stance on fighting inflation, namely that the central bank will move to nip pricing pressure in the bud with interest rate hikes when there is any sign of accelerating inflation. With that in mind, many expect that Bernanke's view on interest rates should be similar to Greenspan's. And Bernanke stressed at Monday's announcement that he would not differ too much from Greenspan. "If I am confirmed to his position, my first priority will be to maintain continuity with the policies and policy strategies established during the Greenspan years," he said. "I'll do everything in my power, in collaboration with my Fed colleagues, to help ensure the continued prosperity and stability of the American economy." More of a hawk on inflation? The Fed has raised short-term interest rates 11 times starting in late June of last year in a bid to keep inflation in check. But economists are now debating whether the Fed is close to stopping or if inflation remains a major threat. And some expressed concerned about comments Bernanke made in a speech as Fed governor that suggested he would consider actually sparking higher inflation in order to combat the threat of deflation, or falling prices that can cripple the economy. "The U.S. government has a technology, called a printing press (or, today, its electronic equivalent), that allows it to produce as many U.S. dollars as it wishes at essentially no cost," Bernanke said in remarks to the National Economists Club in Washington in November 2002. "By increasing the number of U.S. dollars in circulation, or even by credibly threatening to do so, the U.S. government can also reduce the value of a dollar in terms of goods and services, which is equivalent to raising the prices in dollars of those goods and services," he said. During that speech, Bernanke added that "prevention of deflation remains preferable to having to cure it. If we do fall into deflation, however, we can take comfort that the logic of the printing press example must assert itself, and sufficient injections of money will ultimately always reverse a deflation." Those remarks could raise some concerns about his approach to monetary policy, said Chip Hanlon, president of Delta Global Advisors, an investment advisory firm in Huntington Beach, Calif. "He's going to find it difficult to distance himself from his printing press comments," said Hanlon. Then there's the question of Bernanke's support for so-called inflation targets. "Maybe he will act more to target inflation and be more strict" than Greenspan was, Hanlon added. But Mark Zandi, chief economist with Economy.com, a research Web site, said that even if Bernanke were to adopt specific inflation targets, that would not be that much of a departure since he thinks the Greenspan Fed has been aiming for an unofficial target of annual "core" inflation between 1.5 percent and 2.5 percent for the past few years. Zandi added that despite the market's short-term unhappiness with the Fed's rate hikes, investors still would rather have someone in the mold of Greenspan, in other words, someone who won't let inflation get out of control. "Wall Street is happy with Bernanke's seemingly hawkish stance. At the end of the day for stocks and bonds, what matters most is low and stable inflation," Zandi said. "Ultimately, if you err on the side of being dovish it will only come with more pain from slower growth. The hit to growth would be more substantial from higher inflation than from interest rate hikes." Still, Ritholtz said that faced with concerns of a slowing economy as well as price increases in energy and food, Bernanke, if approved, will face some tough challenges ahead. "He will be dealing with a combination of a slowing economy, inflation pressures and a tumultuous stock market," Ritholtz said. So all eyes will be on Bernanke to see if he can also keep the economy on solid footing. Greenspan, who became Fed chair in 1987, was widely praised for his handling of several economic problems, such as the 1987 market crash, a real estate collapse in the early 1990s, the crisis in Asian, Latin American and Russian markets in 1997 and 1998 and the aftermath of the September 11 terrorist attacks. One economist expressed concerns that Bernanke, who has spent most of his career in the academic world, may lack some of the "real world" experience that Greenspan was able to use as Fed chair. Before serving as Fed chair, Greenspan spent several decades as the head of an economic consulting firm in New York and served as a director for many large corporations. "Despite Bernanke's sharp macroeconomic intellect we're afraid that he may not be able to conduct monetary policy with the virtuosity of a maestro," wrote Richard Yamarone, director of economic research for Argus Research Corp. in a report Monday. He added that "Greenspan's ability to accurately appreciate economic conditions is due to his expansive experience as a practical economist." But Bill Davison, managing director of fixed income with Hartford Investment Management, said he was not worried about Bernanke's background. "During volatile periods in the market you don't want to rely on academic theory. You want to rely on market practitioners. But Bernanke seems like a smart guy who has been around the Fed process and I don't anticipate he would make big mistakes in volatile situations," he said. Davison added that he expected Bernanke to continue the recent spirit of openness in the Fed that has marked Greenspan's tenure. In recent years, the Fed has given a lot more information to the markets about its rate decisions -- in a much more timely fashion. In other words, Davison thinks Bush came to the conclusion that if it ain't broke, don't fix it. And that's a good thing. "Bush has insured a smooth transition with the least amount of disruption to Fed policy," Davison said. "That's what the market needed." 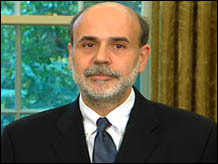 For more about Ben Bernanke, click here. For a look at why who the Fed chief is matters to you, click here.